Does Your Contracting Company Suffer From Any Of These Symptoms? 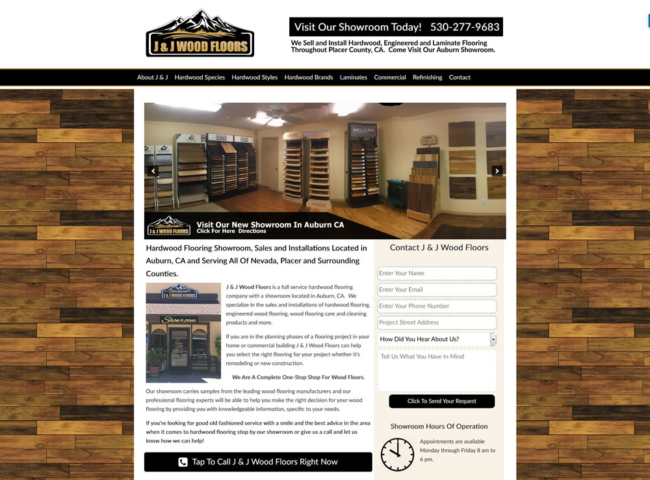 You have a website but it doesn't do anything for your business? You go weeks or months between project leads from your website? You're embarrassed by your website when clients ask if you have one? Your website doesn't reflect the amazing quality of your work? Your competitors out-rank you in Google and get better jobs than you? Word-of-mouth advertising is not enough to keep your bills paid? We Have The Solution That Solves These Problems! We get exceptional results for our contractors and based on the type of projects you do and their value we think we can help you make more money. 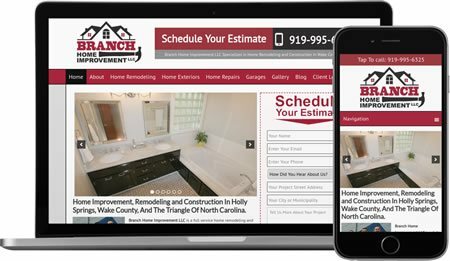 Many Contractors Waste THOUSANDS Of Dollars On Poorly Built Websites & Badly Implemented Online Marketing Before Finding Us. We've Doubled, Tripled, Or Even Quadrupled Their Results. If you don't see your trade listed - just ask! Now, more-so than ever your website needs to be mobile friendly and responsive so that users on all types of devices can access and use your website without difficult. The path for them to take the next step and become a prospect for your business must be crystal clear. Tap-to-call functionality makes it easy for potential customers to call you. 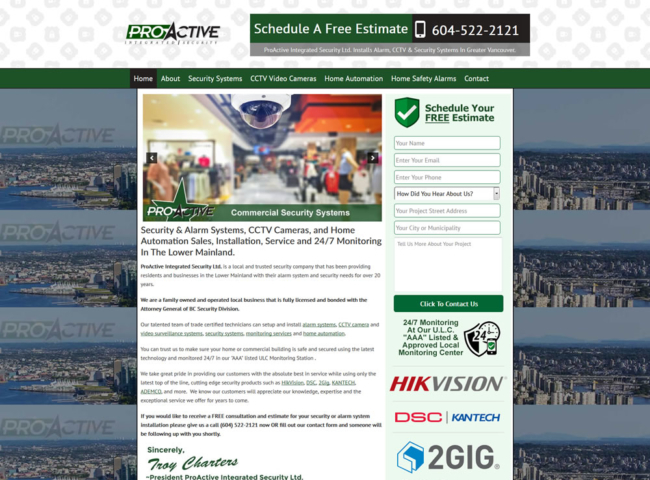 Our websites and servers are optimized for a fast loading experience on all devices. 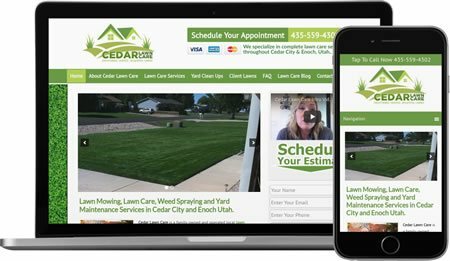 Our fully responsive websites are 100% ready for Google's "mobile first" ranking index. Customers can request an estimate without endless scrolling or surfing around. Contact form located above the fold and easy to access without any scrolling. 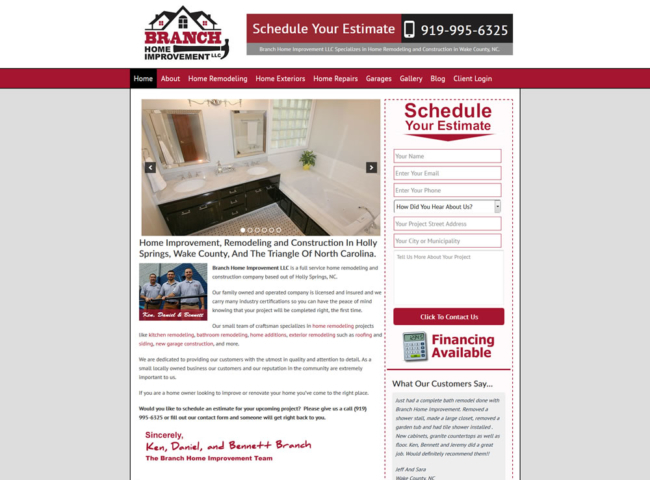 Our websites offer an excellent user experience, eliminating confusion. 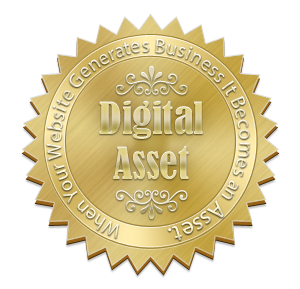 Your Great Looking Website Is A Digital Paper Weight If New Customers Aren't Finding You In Search Engines. Our Approach To SEO Is Rock-Solid "White Hat" & Extremely Effective. A website without Search Engine Optimization is about as useful as a measuring tape with no markings. No matter how nice your website is or how much of your hard earned money you've spent on it, if it's not found by potential clients, it's a digital paper weight. There are many web developers selling contractor websites for top dollar and they have little to no idea what actually makes a website rank. Our strategy to get a website to rank well locally (in Google Maps) and in organic search is aggressive, white-hat, and thorough, we leave no stones unturned. We often do website analysis for new clients who've been spending top dollar on an SEO firm only to find out their SEO firm has done virtually nothing but take their money! In the confusing world of Internet Marketing and Search Engine Optimization it's EASY for a contractor to get ripped off and taken advantage of. On Page SEO includes everything we do when building your site. We guarantee your "On Page SEO" will be rock solid and we don't get lazy or cut corners. It's hours of extra work for us, but you know it's done right! We make sure all of your project and job photos have proper filenames with proper image meta-tags (Alt Img tags), and they are optimized and resized for fast loading. An opportunity wasted by many competitors. 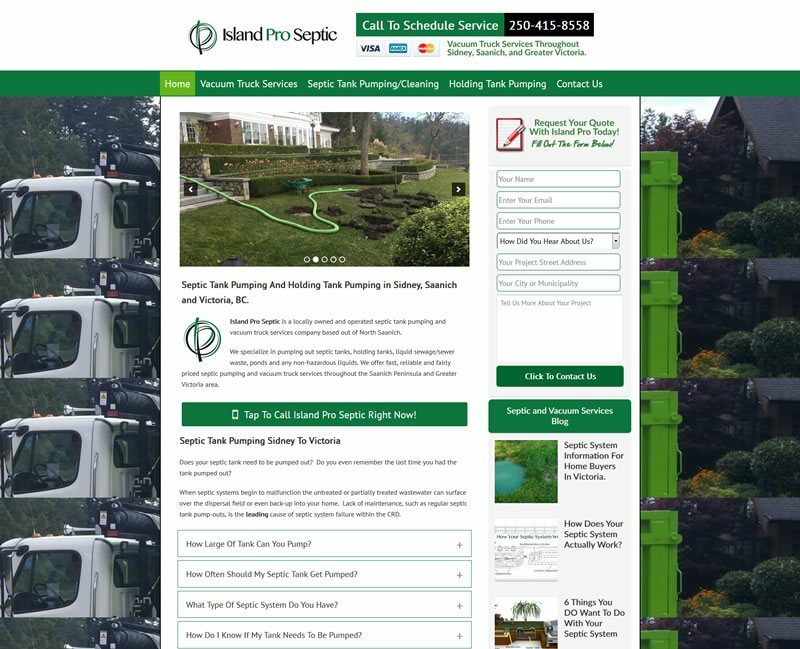 We make sure the pages of your website have a logical, yet descriptive URL structure so it's easy for Google to understand and index your pages properly and easy for visitors to find them when they search. We hand craft all of your page titles and meta tags so they are unique for each page of your website. They follow best practices and will entice visitors to click your listings that show up in the search engines. We create an optimized page for each key (profitable) service you offer. This increases your page "footprint" and your opportunity to be found. You won't find us building skimpy little five page websites. 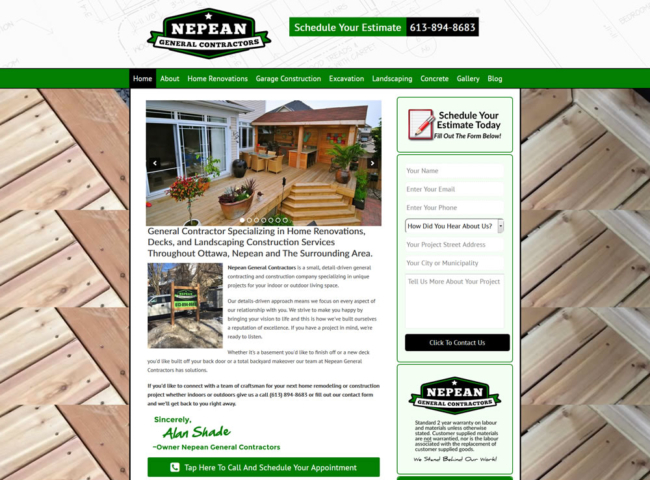 We create an optimized page for each of your core service areas you'd like to work. We call these "Service Area" pages. We try to target wealthier, more affluent areas where people who can afford your services reside. We write all of your content in-house. We've honed our web copywriting skills over many years and we write persuasive and engaging content that increases your relavancy and positions you as the expert in your field. We setup and install Google Analytics so we can effectively track your website activity such as how many visitors you receive, what pages they visit, your bounce rate. We only make data driven decisions. Schema is "microdata" that helps send signals to the search engines about your content and what it's about. Very few designers implement schema because they don't know how or are too lazy. Not us! Google Search Console is a service offered by Google to monitor your website. We set this up so we are notified quickly if there is ever an issue and it also allows us uncover new keyword opportunities to target. We write informational and engaging blog posts to help draw in more targeted search traffic. Our competitors often out-source this work to cheap writers over-seas. We write all of your content in-house. We make sure your website is optimized for speed and that it loads quickly on all devices and gets a high score with Google's page speed testing tool. Faster sites get a ranking edge and lower bounce rate. "Off Page" SEO is what happens "off" your website and involves items like social media profiles, local citation building, targeted backlink building, community outreach, local publicity, and analyzing your top-ranked competitors websites (for more opportunities). This is one area of Internet Marketing where it's extremely easy to be taken advantage of because you really don't know what your web guy/gal is or isn't doing. Here's What We Do - For Our Clients "Off-Page" Optimization. Off Page SEO includes everything we do AFTER building your website. We put great emphasis on our clients off-page SEO because off-page SEO is a major contributing factor to how well you'll rank. We'll setup all the most important social media profiles for your business. This helps boost engagement with your website, and increases your "social credibility". Social media profiles are also great backlinks. When your NAP (Business name, address, phone number) is on another website it's considered a "citation". Accurate and up-to-date citation profiles contribute to your rank in Google Maps. We build them for you. Backlinks are like citations, except they "link" to your website. This builds your "authority" and really propels your site up the ranks. We build out a relevant and targeted backlink profile for your website. We search for local opportunities in your area where you can sponsor local community events or organizations. In turn you get a backlink from their website. These local backlinks are very powerful. We reach out to local media agencies in your area to search for opportunities for your business to be featured. This is another source of powerful, local backlinks that really drive your site up the ranks. We look at your top-ranked competitors websites with powerful software that finds all of their citations and backlinks. We then go and acquire all of their best, most valuable citations and backlinks for you! We use powerful software to monitor your website and all of the links and citations that point to you. We make sure they are accurate, complete, and not hurting your potential to rank in search engines. We can setup and manage your Pay-Per-Click campaigns on Google, Bing, and Yahoo. Not all of our clients need or want this but for those who do, we are very experienced and ensure your campaigns are setup properly. 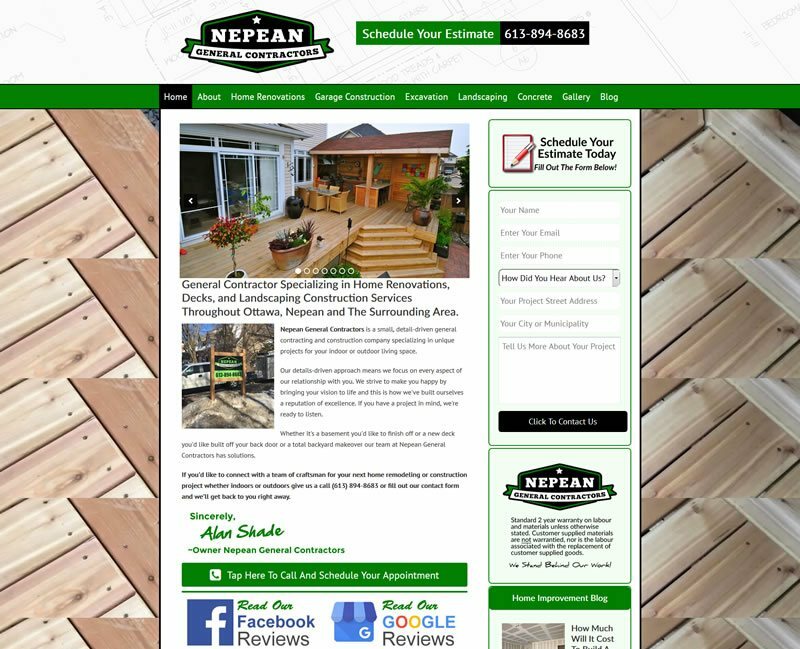 Websites, SEO and Internet Marketing Exclusively For Construction And Trades Contractors in Canada and The USA. 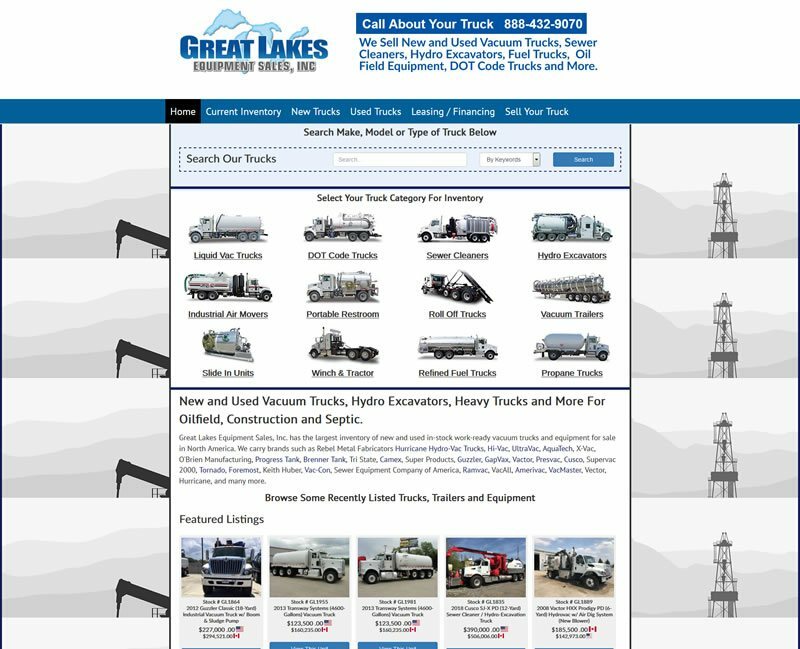 If you’re on this website it’s because you are a trades contractor of some type and you’re looking for a website solution to help give your company a competitive edge in this new and confusing age of Internet Marketing. Maybe you’ve had a bad experience with another web development company who’ve failed to deliver any kind of results? Maybe you’re a sub-contractor trying to get out from under a General Contractors thumb and you want a new method for acquiring work? 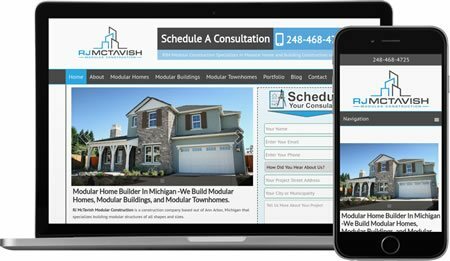 Maybe you’re starting a brand new contracting company and you want to choose a great web marketing solution to get your new business off the ground? 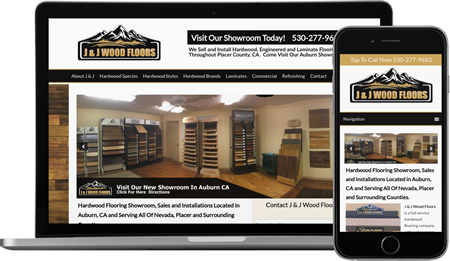 Whatever your reason for wanting a new website for your contracting company, you’ve just stumbled upon a great place to learn how to grow your business using the web. 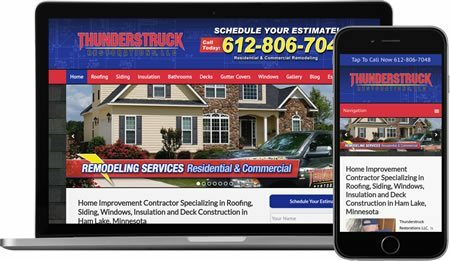 We've been helping contractors straighten out their websites and Internet Marketing since 2007, even if you don't choose us, we'll be able to provide you with some valuable insight that will help you move your contracting business forward in this rapidly changing world of Internet Marketing. I want to thank you for the great job on my website! When we first spoke about this two years ago, I was undecided on creating a new site or just keeping my junky old free one. I must say this was the best decision that I've made when it comes to advertising my company. The cost for the initial build was very reasonable (when compared to other firms) and the ongoing seo packages that you offer are a bonus. I like that you will formulate a plan based on where the main focus needs to occur rather than stay with the same cookie cutter template. From the launch date it took some time to see the results come to the forefront although we knew it would happen and it did. I've been receiving plenty of quality leads and great clients from the website and always hear compliments on how much more professional it is than others in the area. My conversion rate from other review sites is awesome. When potential clients read reviews, then navigate to the site I've noticed that they are staying on the site and providing inquiries for our services. Many of these things simply were not happening with the previous site and we've shown a huge increase in volume the last year along with our schedule being full for the next 4 months to come! I particularly like your non-compete clause that will allow me to be the only contractor in my service areas that you deal with. It's a great touch and offers a complete one-on-one service. 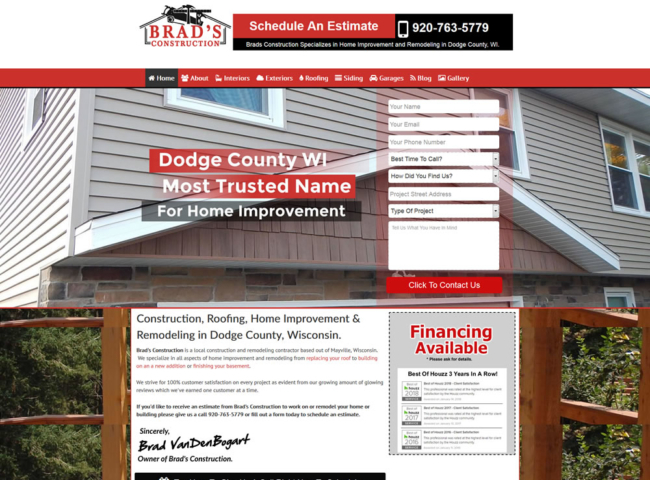 The site has grown so much and (along with my great blog) has become probably one of the most popular remodeling sites around. I look forward to the future and glad that you're part of our team!!! Feel free to have ANY of your potential website clients contact me because I will ensure that they will make a good choice. Carl, I am very pleased. Your website brings in more leads in a month then my old one did in years. I have gotten many positive responses. It has been described (to me) as 'professional' 'better then the competition' 'shows your company in good light'. Not a negative really-but I of course get tire kickers who just want to spin wheels. I'm particularly pleased it had lead to 2 expert testimony jobs (small but significant as anyone searching that-is searching hard). Feel free to take my comments and use them for testimonial on your site. Hi Carl, I just wanted to drop you a quick line to express my gratitude for what you and your company has done thus far to help 1st Choice Plumbing become so successful.As you know, I started 1st Choice about a year and a half ago without one single customer! It was a very scary time in my life and I knew that picking the right company to create my website was going to be critical. After months of research I narrowed my decision down to two companies and with a final phone interview, I knew in my heart that you were the one. The time you spent, enthusiastic energy and expert knowledge you portrayed made me feel confident I was making the right decision. I do have to be honest though. I did fear that the level of attention you gave me that day on the phone would not continue once I became your client. My worries were baseless! Every time I call you with an idea or concern you spend whatever time is necessary until I feel confident we have it right. And... You give me just as much enthusiastic energy as you did on day one! The proof is in the pudding though right? It amazes me how competitive of a market Cleveland is for plumbing. We have large plumbing companies spending huge marketing dollars that 1st Choice could never compete with yet when you Google "Cleveland Plumbers" we come out right on top of page one. How awesome is that! It is not uncommon at all for us to get four plus phone calls a day! Out of all the marketing strategies we've tried, non can compare to the results we get with our website and for that I want to thank you! If ever you run across a potential client who is on the fence much like I was a year and a half ago, please do not hesitate to have them call me. (440) 812-1888. Thanks again Carl! 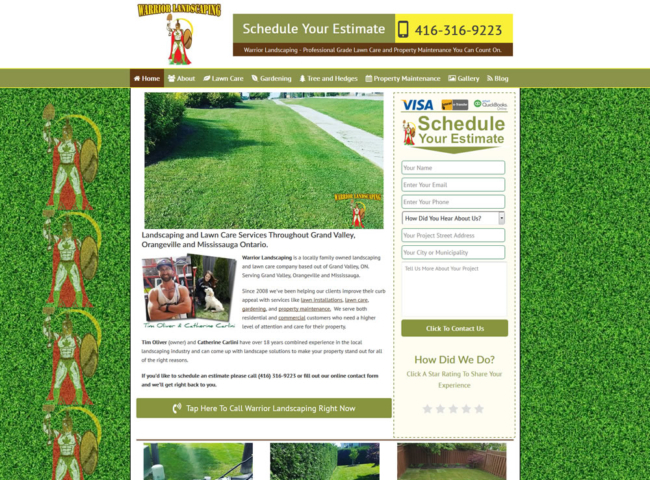 I was first introduced to Carl of Sites4Contractors.Com via an internet forum which I frequent. In a field plagued with hot air blowing crooks and less than scrupulous self proclaimed seo whiz kids, it was refreshing to read his down to earth; easy to understand take on what is most important to me, converting clicks to leads. In April of 2012 he provided me a very detailed proposal including a nice visual aid of how he was proposing to layout our new site. The price was competitive, but after my past nightmares with seo “professionals” I was more than reluctant. Being a business guy myself and understanding that you get what you pay for I was a bit cautious of how affordable his proposal was. Im not really your average blind prospective client. I have been researching seo and marketing for as long as I can remember. I thoroughly vetted him, called his past clients, and researched the techniques he was proposing in depth. After everything checked out I took one for the team and hired him to not only completely overhaul my site but also manage the ongoing seo and maintenance of my site. He delivered quickly and not only provided everything he promised but much much more. Almost instantly the quality and quantity of my construction leads increased dramatically. This influx of leads empowered me to build my company from just another good guy with a truck to one of the premier remodeling companies in my market. I can honestly say that the money I spent with Sites4Contractors was the best investment I ever made for my business and consequently my family. 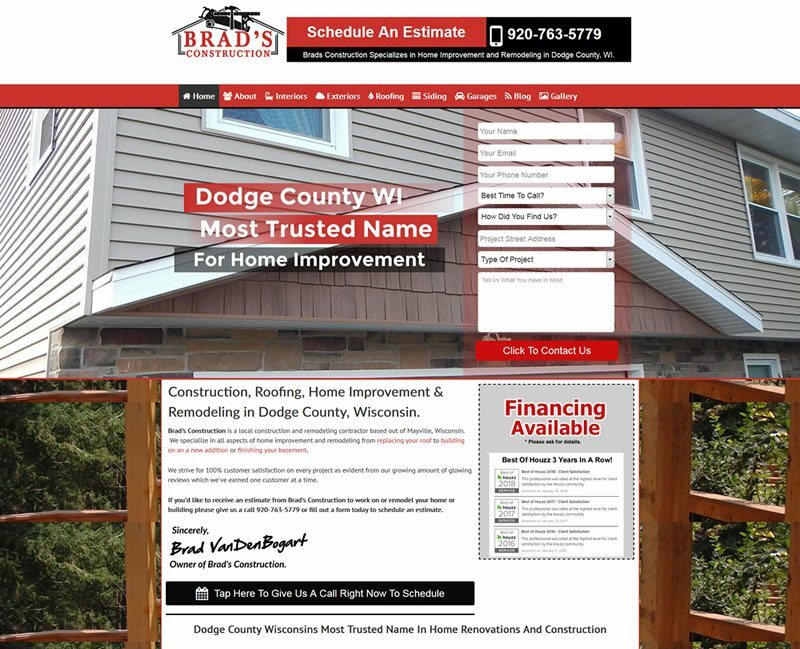 If you own a construction company, the only way you will be able to turn a couple of thousand dollars into a few hundred thousand dollars in business is to have Carl and his team of skilled technicians transform your entire web presence. Every month the amount of web leads we receive increases, and every month I am reminded of what a great ROI I am getting from my dealings with Carl. If you are considering investing in your business’ future, there is no better option for you than getting aboard his team. I sleep better knowing that my internet presence, and companies future is in the hands of a true professional. The worst thing you can do is wait too long allowing one of your competitors the opportunity to sign up first. Hi Carl, Sorry it has taken me so long to write this to you but I've been busy and finally have some down time. I wanted to say that one of the mistakes I have made with my business is not deciding to hire you for my website work when I first found out about you. Looking back, I am sure that mistake cost me the potential to make hundreds of thousands dollars worth of income. As you know, the company I originally hired was local to me and talked an incredibly good game. They had a good reputation and were part of multiple trade organizations around the area. I thought I could trust them to do a good job and over the course of three years, paid them over $20,000.00 for my website and SEO work, all while not knowing it was being farmed out to foreign companies. This eventually got my site black listed by Google and is why we touched base. Since you took over and re-designed the site, I have gotten more compliments on it than I did all the years before. More importantly, after a few months of your hard work, we were able to get the site back into the Google rankings so people could once again find my site. Since the site started ranking well again in late June, I've had over 130 contact forms filled out and lost track of how many direct phone calls were generated from the website. 2014 was our best year yet, doing 30% more sales than last year. 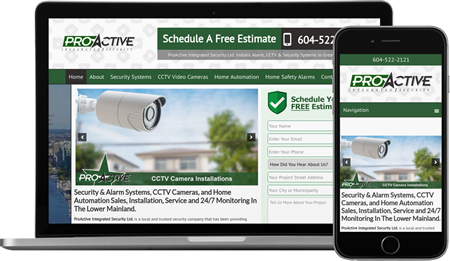 I attribute a lot of this to the website and the extra work it created and because of that, we were able to hire on additional employees, grow the fleet of vehicles and help more customers remodel their homes than ever before. ​I am excited and look forward to seeing what can be done for 2015.​ Once again, Thank you for not being like the other website guys. I appreciate the straightforward and honest approach you take. I just wanted to say a big thank you to Carl for his expertise. Just a few short months ago (September 2015) I was getting ready to start my own landscape and lawn maintenance company after working for another company for a few years. Fall is not the best time to be starting a landscaping company! I knew my marketing was going to determine whether I'd sink or swim and I also knew that having a good website that ranked well was going to be important to get me in front of the type of customers we are seeking. After a couple of conversations we not only hired Carl and his team, we took him on as a business partner! 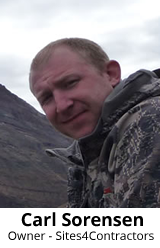 Carl built our site and took care of the search optimization and within 2 weeks of our site launching we had our first web lead! We didn't close them unfortunately but that first lead told me that the website was money well spent and it wouldn't be the last opportunity we'd have. Here we are September 2016 and the website now ranks in the top spots for almost all of our target services in a very competitive market, we've received over 300 contact form fill outs and tap-to-call phone leads. This has resulted in us bidding on over $540,000 worth of work with the largest project we've closed so far being a $45k softscape install. It's been a fantastic year for our new company. Before getting to know you I was a cautious skeptic about the web and how it would help us but to say we are thrilled with the results would be an understatement! You supercharged our website and Internet Marketing and gave us a professional presence amongst a sea of entrenched competitors and for that we can't thank you enough. Thanks again for everything you've done for our new company! 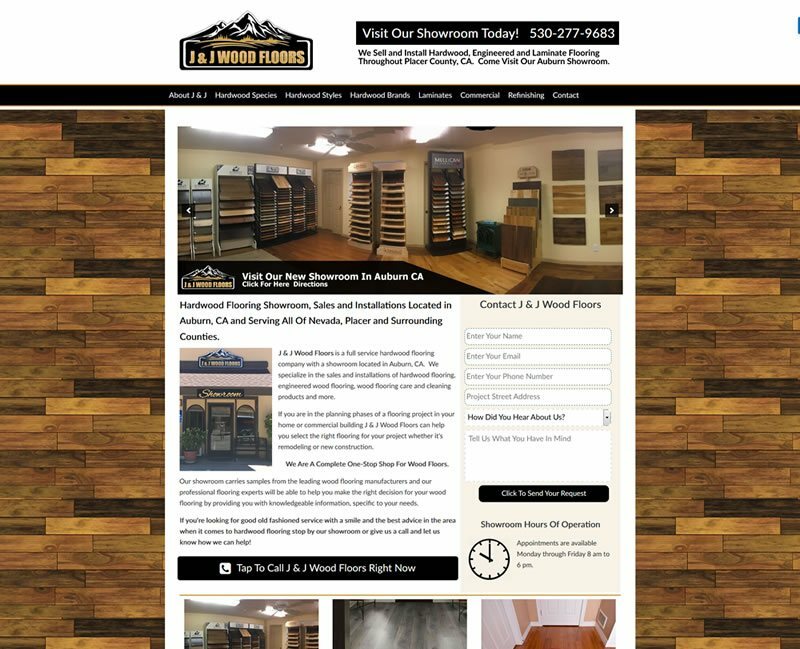 Two years ago I contacted Carl to build a website for my remodeling company. At the time I did not have a website and was only getting leads through word of mouth. 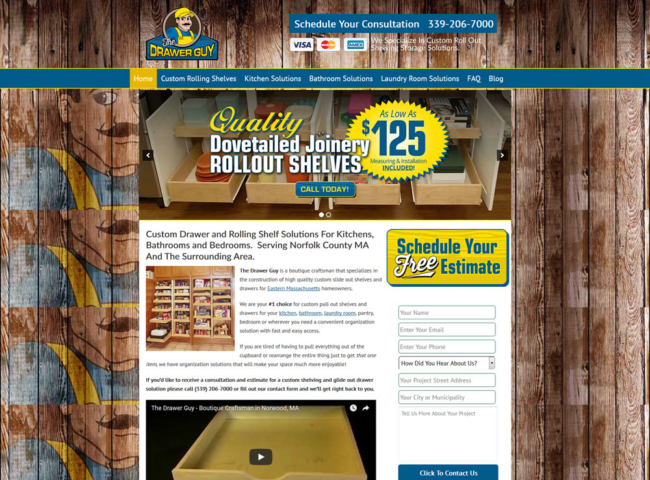 I wanted more substantial projects with an online presence to give legitimacy to my company. At that time, the cost to build the site was out of my budget, but Carl assured me it was a wise investment. I was impressed by how well the process was presented, and his level of communication and professionalism. I made the plunge. I can now say that this was the best decision I have made for my business. The results were not overnight, but with time the momentum has built and continues to bring results. My expectations continue to be exceeded. One of the most valuable tools was a website tutorial video specific to my site, Carl sent me this once the site was up and running. This gave me insight and instruction on how to make changes to my site and have full control of the content. Carl is also very generous with his time, as a client the amount of knowledge you can get from a 5 minute conversation with him is incredible. He knows how to get results, and has continued to support me and give attention to detail long after the sale. 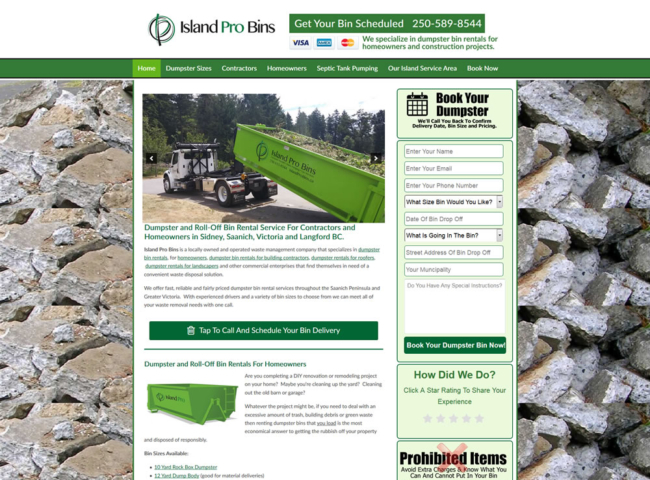 If what you are looking for in a website is leads to generate sales, "sites4contractors" is the best investment to make for your construction company. Click Here To Contact Carl Right Now! We only work for 1 (one) contractor per trade, per service area. It would be pretty shady if we were sharing our wealth of Internet Marketing knowledge with you, only to turn around and sell the same strategies to your local competitors! You feed your family and your employees families with your business and we understand that (we do too!). We work extremely hard to make sure that your web presence gets you found and delivers high quality leads looking for your services. *You must be an on-going SEO client for regional exclusivity. 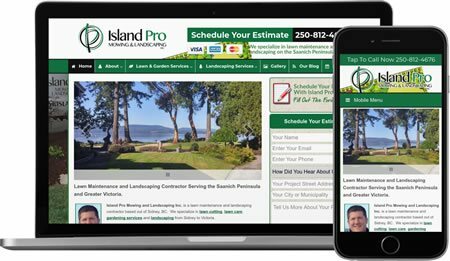 What Does a Sites4Contractors Website Cost? In most cases our websites and Internet Marketing will cost less than our competitors and you're getting a lot more knowledge, expertise, and value. Many of our clients have spent thousands of dollars on web designers who could talk-the-talk but when it came down to brass tacks, they couldn't walk-the-walk. 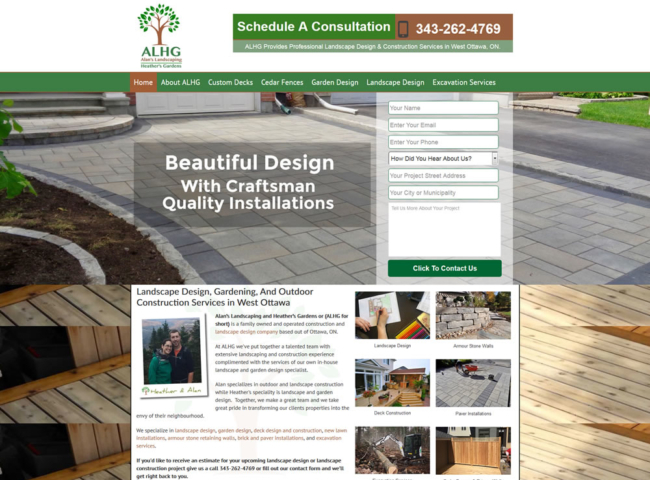 To get individual pricing for your contractor website please contact us. 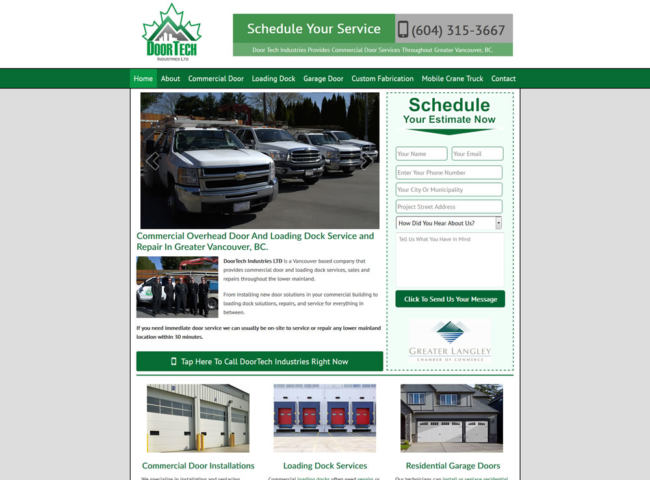 We can have your new website ready for your review within 2 - 3 weeks of receiving your deposit. Once you're happy with the site and it launches we can begin the SEO portion of your package. Do I Ever Own The Website? Yes! After your first year the website is yours 100%. You own the website and the SEO work that was performed isn't something that can be "taken away". Can I Edit The Website On My Own? You Bet! We build our websites using WordPress and you'll have access to your admin panel once the site has been paid for. We're doing most of the heavy lifting for you but there are a few things you can do that really help us out! #1. Put in your deposit. We operate on a first come first serve basis. #2. Provide us with a logo and your color scheme. #4. Provide us with as many photos as you can. 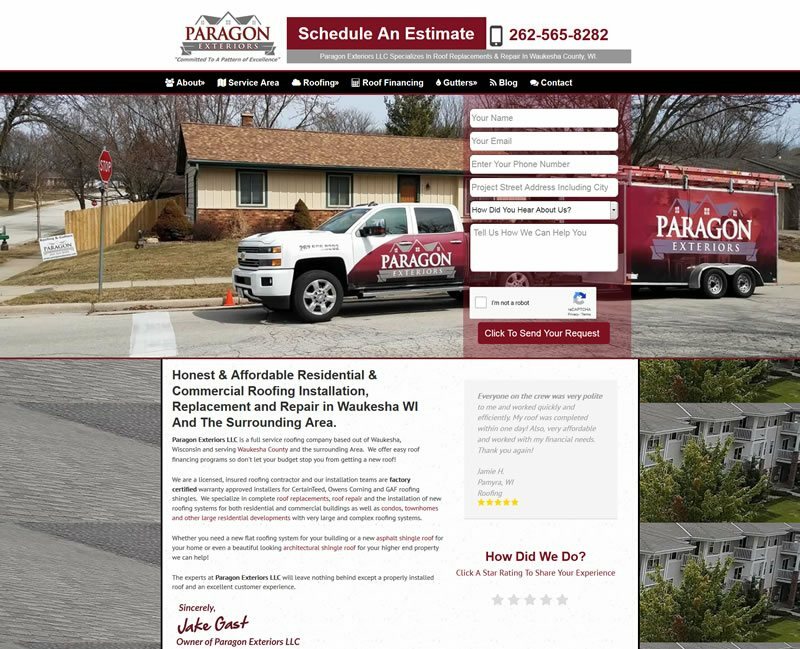 When you set out to build a website for your contracting company it's important to understand the purpose of that site. You're hiring someone to build it because you want to make more money with your business. Sadly, most designers will treat you as another pay check without actually caring about your business (or it's growth) in the slightest. 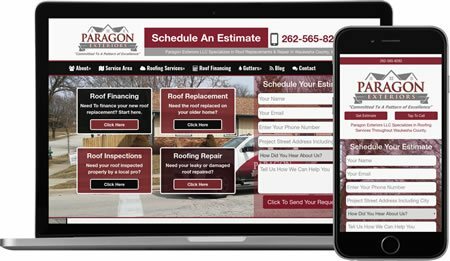 When you choose Sites4Contractors.Com to build and manage your contracting company website you're teaming up with a group of Internet Entrepreneurs who understand the value a website should deliver for a business. If it's been months, or even years since your website delivered a new lead then it's not an asset! 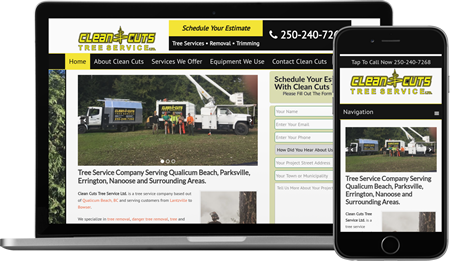 It's a money pit and you need to cut your losses and turn us loose on your website. If you're ready-to-go or you have questions and want to speak with a real person please fill out the form below or give us a call 1-250-738-0600.